When you say "I do" to a bridal gown from Blue by Enzoani, it shows that you're seriously committed to high fashion. Designed with intricate details and modern silhouettes, the Enzoani Blue collection is the perfect fit for the show-stopping bride. Walk down the aisle in an Enzoani Blue wedding dress and feel like a modern day princess! 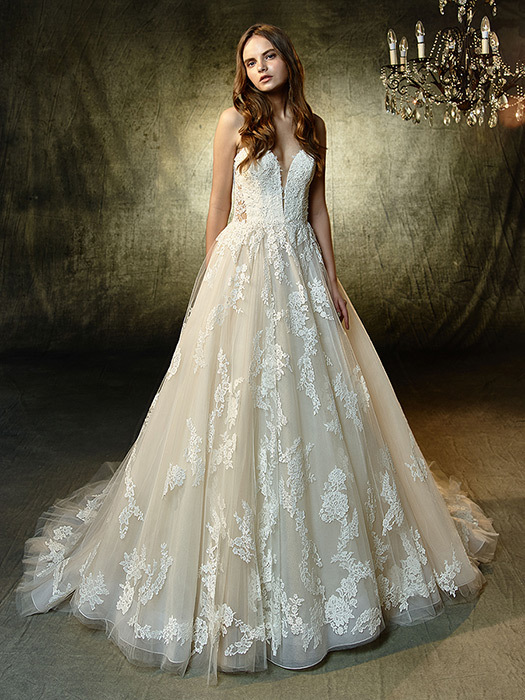 In this season's Enzoani Blue collection, the traditional ball gown gets a modern update with a sheer bust and soft romantic lace details. Our whimsical bride can gracefully walk down the aisle in layers of soft tulle and lace. Our classic bride can show off her figure in a crepe fitted sheath silhouette with a sheer extended train. Or dance the night away in a stretchy trumpet silhouette accented with the bold lace and delicate crystal straps. With style options this dramatic and diverse, you'll be the blushing bride of your dreams! Perfectly balanced with modern and classic touches, the Enzoani Blue collection features something special for ALL types of brides. 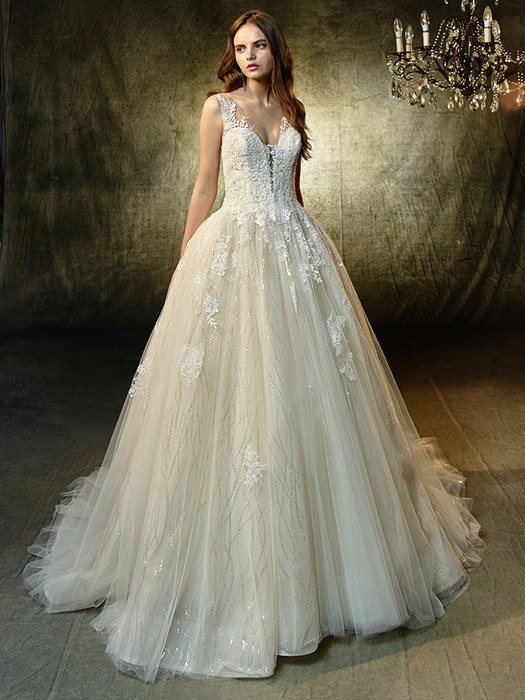 For an ultra glam wedding style, get swept away in a mermaid gown made with a rhinestone-encrusted lace bodice and finished with a floor-sweeping skirt in dreamy layers of tulle. Or look like a contemporary princess in elegant satin silhouettes; intricate details like lace embroidery and satin covered buttons lend a regal and couture charm to a sleek and understated wedding style. Ready to say YES to the dress? Grab your girlfriends and head to our mega-store, which features an exclusive collection of Enzoani wedding dresses and so much more. With 30 years of experience in formal wear, our tried-and-true approach starts with a one-on-one consultation with one of our expert style consultants. Book your appointment today and prepare to leave our showroom with the wedding gown of your dreams!